The philosopher Emmanuel Levinas suggests that the possibility of conscience is given by the possibility of abandoning it: sleeping. In this way “The power to sleep” comes to be this capacity and possibility as well as its abandonment. The power to sleep is a work about human relationships, interaction with others and consciousness. intention (consent) in human relations. Another way to present dormant works is a polysemic space of intimate interaction, imersed in the play of the public eye and producing multiple layers of interpretation. 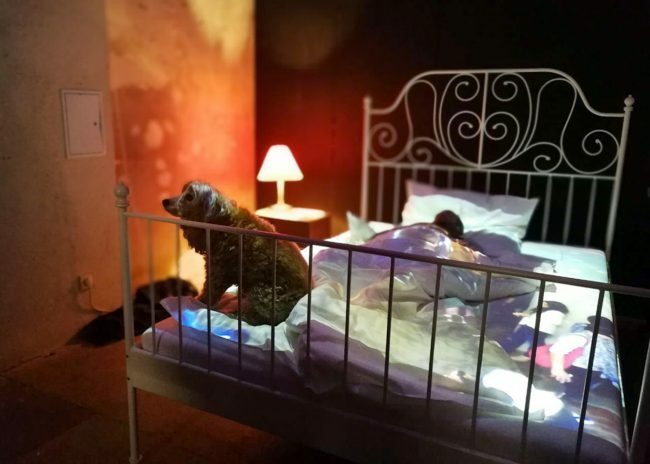 TPTS seeks, through the exhibition of the intimate space of the sleep, to explore the interplay of social interactions that the intimate life entails. For this the artist is located in the privacy of his bed thrown to the public sphere. The public is projected onto his bed. The visitor can interact within certain suggestions offered in form of cards placed on the bedside table. Sebastian Diaz Rovano is a chilean artist. He studied architecture, cinema and Anthropology as a diverse background of his Art. The last twelve years he worked as a lighting designer mixing technical tools with expressive skills giving a unified expression between graphic universe and scenic environment.